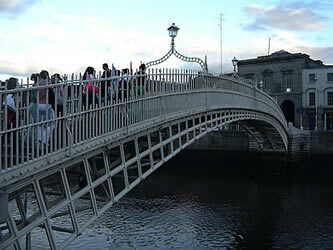 This page provides a brief introduction to Dublin, the capital city of the Irish Republic (Eire). 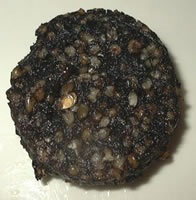 The city is named after a Black Pool ("Dubh Linn") near the castle. 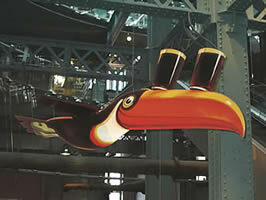 The top visitor attraction in Dublin is the Guinness Storehouse in St James's Gate. 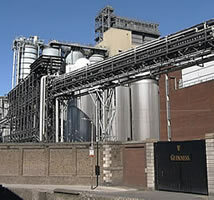 You can find out about the history of Guinness and see how it is made. 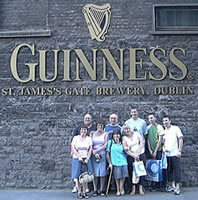 You finish at the Gravity Bar, where you can have a free pint of Guinness and enjoy the views over the city. 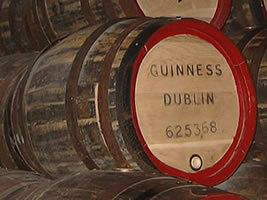 Guinness has been brewed in Dublin since 1759. 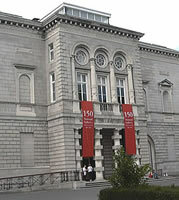 Trinity College is Ireland's oldest university and is located in College Street in the centre of Dublin. 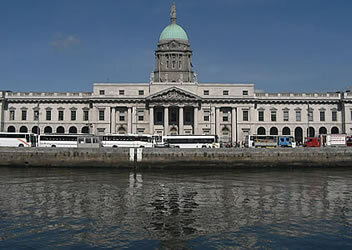 It was founded in 1592 by Queen Elizabeth the First, one of its purposes being to lead the conversion of Ireland from the Catholic to the Protestant faith: for many years Catholics were not allowed to study here. 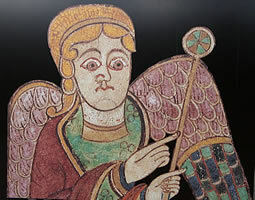 The Book of Kells is an illuminated manuscript dating from the 9th century. 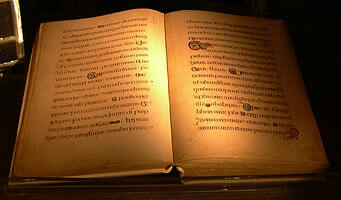 It is a copy in Latin of the four Gospels of the New Testament, illustrated with many fine Celtic designs. 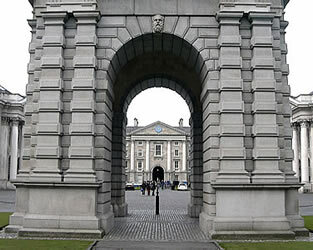 It is one of the treasures displayed in Trinity College Library. 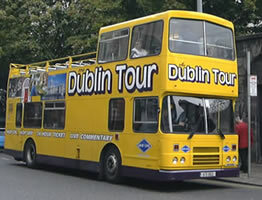 Another visitor attraction inside the college is the Dublin Experience, which presents a summary of Dublin's history (this is only open during the summer months). 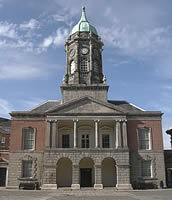 Dublin Castle is located in Dame Street. It is a mixture of buildings of different architectural styles. The Record Tower is the oldest part, dating from 1207. 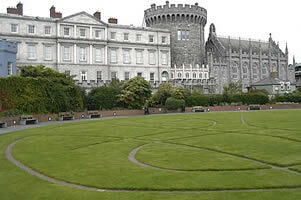 The castle was a symbol of British rule in Ireland, and was attacked unsuccessfully during several rebellions. 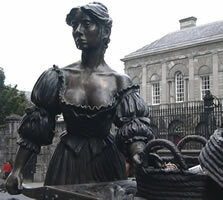 It was handed over to the Irish people in 1922. 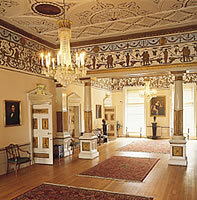 The State Apartments, Undercroft and Chapel are open to visitors. 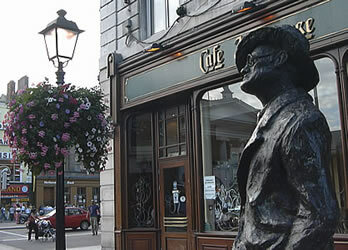 James Joyce (1882-1941) was one of the great writers of the 20th century. 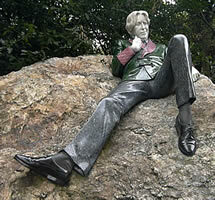 He was born in Dublin, but left Ireland in 1904. 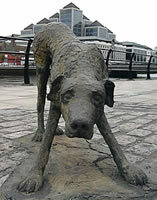 Much of his work is based on daily life in Dublin. 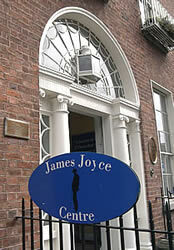 His most famous book is Ulysses (1922). 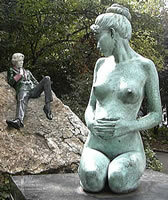 Other works include Dubliners (1914), A Portrait of the Artist as a Young Man (1916) and Finnegans Wake (1939). 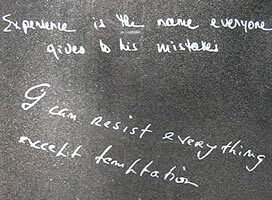 "Experience is the name everyone gives to his mistakes"
"Who, being loved, is poor?" 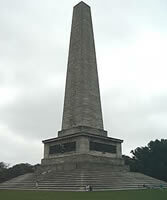 "I have nothing to declare except my genius"
"The suspense is terrible: I hope it will last"
The Wellington Monument is located in Phoenix Park. 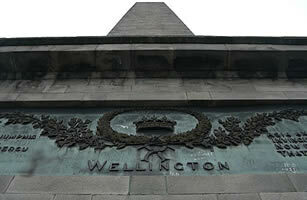 It was built to commemorate the victories of the Duke of Wellington (Sir Arthur Wellesley). 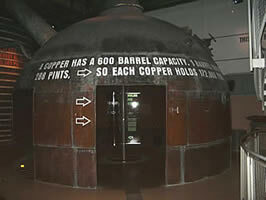 It was finished in 1861. It is one of the tallest obelisks in Europe (205 feet high): it was meant to be even taller and to have a statue of the "Iron Duke" on a horse, but money ran out. There are four bronze plaques around the base, cast from cannons captured at the Battle of Waterloo. 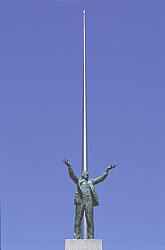 The Duke of Wellington is not popular in Ireland. Although he was born in Dublin, he wasn't proud of the fact: he is reported to have said, "Just because one is born in a stable, one doesn't have to be a horse". 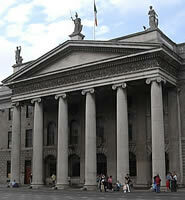 The General Post Office is located in the middle of O'Connell Street. 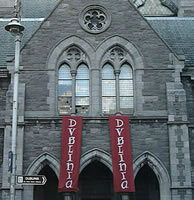 This building was a stronghold of the Irish Volunteers in the 1916 Easter Rising. The rebels held out for a week, but the leaders were then captured by the British and executed. 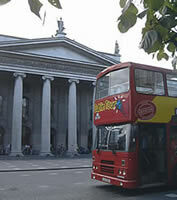 After the "Free State of Ireland" was created in 1921, postboxes in Dublin were painted green: the red ones were regarded as being public symbols of Britain. 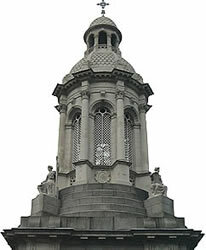 The Monument of Light in O'Connell Street is known informally as the Spire. 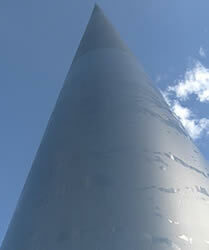 It is 120 metres high: the world's tallest sculpture. The sunlight shines off it during the day, and at night the top is lit up. 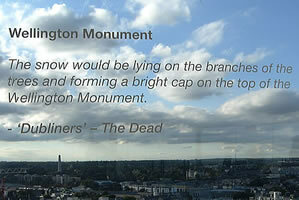 This design, by Ian Ritchie, won a competition to create a new monument in Dublin for the new millennium. 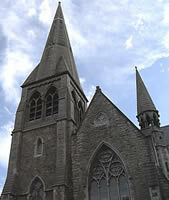 Saint Patrick's Cathedral is in Patrick's Close. 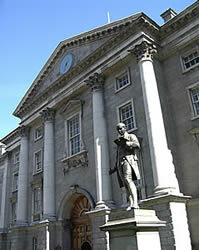 The writer Jonathan Swift, famous for his satirical novel "Gulliver's Travels", was the Dean here from 1713-1747. 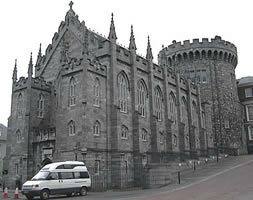 This is the national cathedral of Ireland. 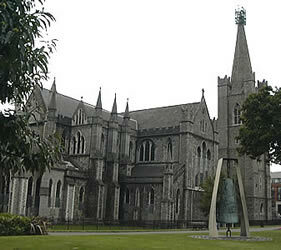 Christ Church Cathedral is in Christchurch Place. 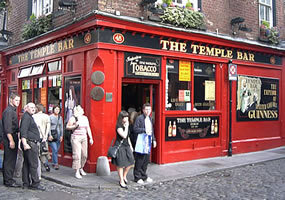 Founded in 1030, this is Dublin's oldest building. 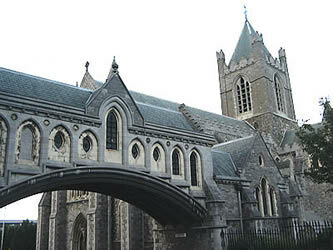 The choirs from both of these cathedrals took part in the first ever performance of Handel's "Messiah" in 1742. 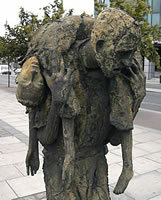 The Famine Memorial is located on Custom House Quay. 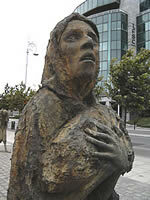 During the Great Famine in the mid 19th century over a million Irish people died or left Ireland to escape hunger (many emigrated to America or Britain). Many people blame the British government for this crisis: it refused to provide food aid even after the potato crops repeatedly failed due to disease and poor weather. Crying, "Cockles and mussels, alive, alive oh! Alive, alive oh! Alive, alive oh!" 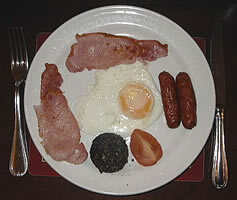 Crying, "Cockles and mussels, alive, alive oh"!